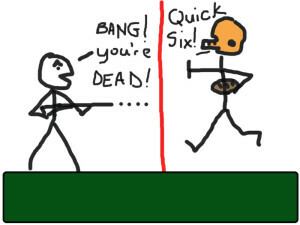 Towards the end of the twentieth century, medical researchers and behaviorists all over the world were looking at the similarities between so-called, “violent media,” such as film and TV, and video games that depicted violence in their gameplay. For many, and certainly all of those who generously gave their time to BOOM Salad in interviews, and other assistance, their motives were simple, protect those who are amongst the most vulnerable in society: children and young people. 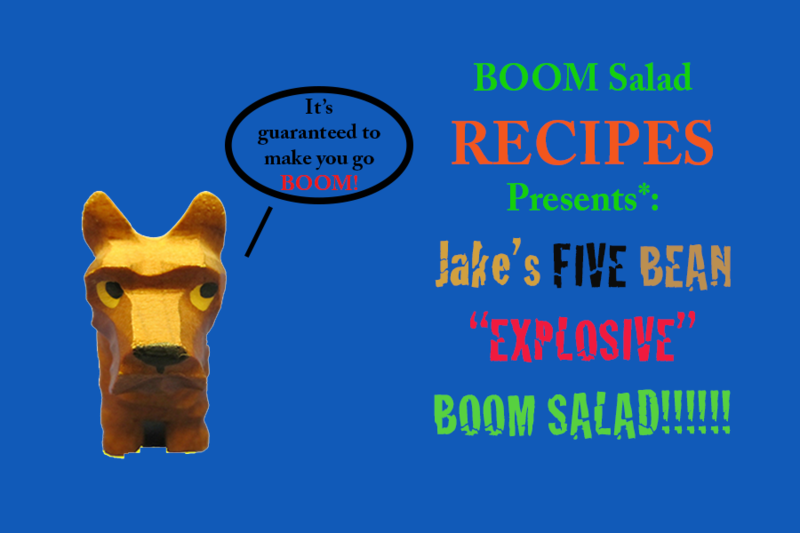 For this reason, BOOM Salad acknowledges and honors the efforts of these women and men of science, and others who have sought to shine a light on why and how video games affect those that play them, why they make us go “BOOM!” as it were, and the corollary effect of video gaming on society in general. 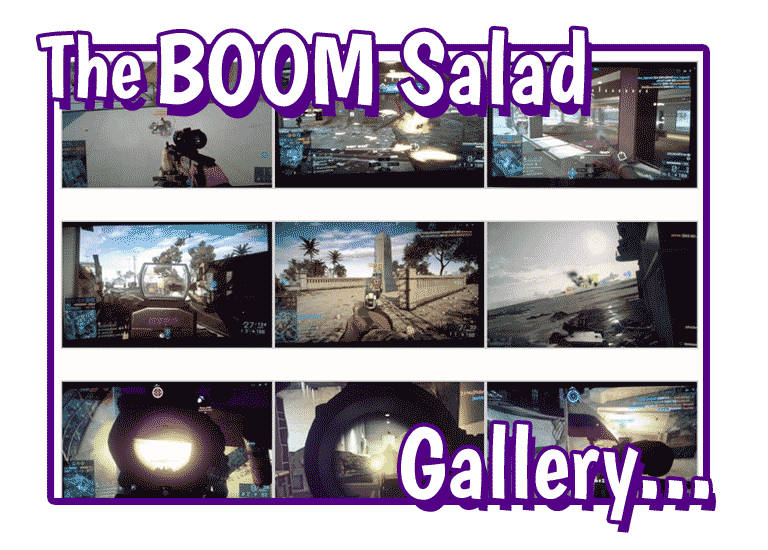 Over the past few months, BOOM Salad has interviewed several researchers considered to be amongst the first to study the relationship between behavior and video games, including Dr. Vincent P. Matthews, Chair of Radiology, Medical College of Wisconsin; Dr. Yang Wang, Associate Professor, Medical College of Wisconsin, Division of Imaging Sciences; and Dr. Brad Bushman, Professor of Communication and Psychology, Ohio State University. The premise of their investigations was based on the assumption that violent-video games are a genre of violent media (see the clinical definition of “violent media” below). 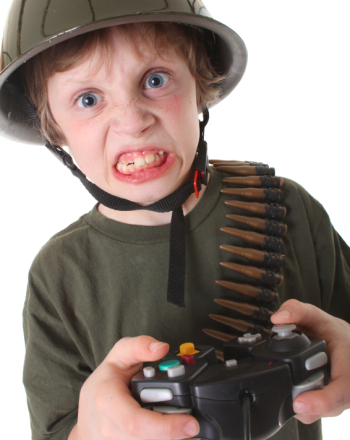 As such, previous research suggested that high exposure to violent-video games would likely cause increased aggression in cognition, affect, and arousal. From this starting point, researchers were able to rely on the confidence of medical studies conducted over the past 60 years that have consistently demonstrated the causal relationship between high Violent Media Exposure (VME) and aggressive bias and behavior. Like their predecessors and contemporaries, the individuals we spoke with were world-class researchers with sufficient funding to establish the credibility of their results. Thus, to challenge the veracity of their findings would be misguided and unfruitful. That is not to say that we agree with their conclusions, quite the contrary, we do not, and for what we believe to be good reasons. 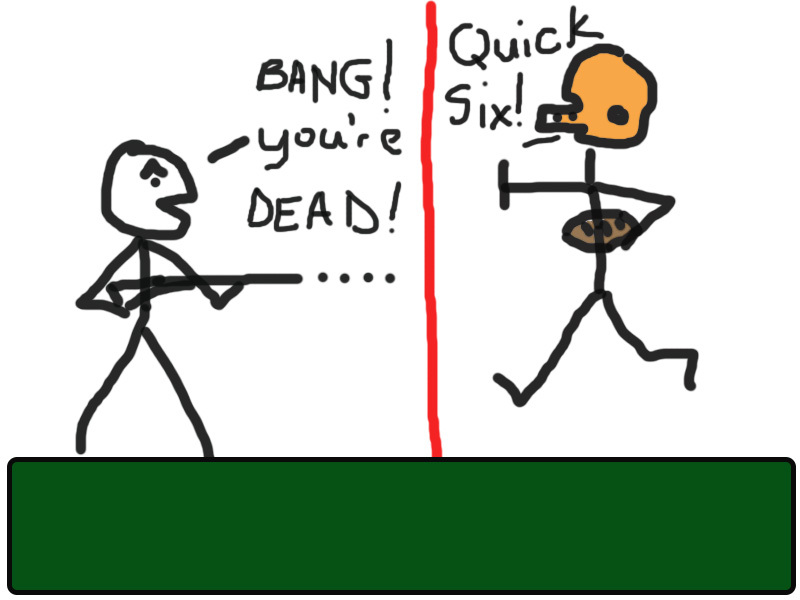 In the following, Part IIa and IIb of the Uncanny Violence of Video Games, BOOM Salad will demonstrate a fundamental error in the theory at the heart of the anti-violent video game argument, while at the same time offering an alternative hypothesis as to how and why these games affect our behavior. Our goal, much like that of the doctors we interviewed, is to root out the cognitive and behavioral context that underlies the ever-increasing fascination with video games in global society. Only by understanding what compels individuals to play the games, can we better determine how it is affecting them and their behavior. As always, it is our Primary Objective that you will enjoy and be challenged by our efforts. – BOOM. Figure 1: The face of aggression? How do we determine how someone is feeling? One way, is by examining his or her expression (see Figure 1). Do they look happy, or sad? Are they smiling, or are they frowning? Another way is through listening to their voice and analyzing their vocal expressions. Do they sound happy or angry? Are they saying words that would indicate happiness or aggression? Through these and other clues, humans “predict” the feelings and actions of those around them. But even with the availability of all this visual and auditory data, we can never be 100% sure how someone is feeling. Why? Because emotions are “unobservable states” that “dynamically change”. In other words, emotions cannot be viewed directly, we cannot see into a person’s psychology and understand, as they do, how they are feeling. Moreover, emotions can change in an instant. For example, when we consume visual media, like film and TV, it is not unusual to feel different emotions as the program progresses. At one moment we are fearful, and then another, hopeful or relieved, and perhaps even at the end, we might feel happy or euphoric, all within the span of two hours. The Entertainment industry relies on this powerful ability to visually and emotionally engage its viewers, as a form of incentive to pay for its products. Given this, the best we can do in assessing how one is feeling at a particular moment in time, is in observing and interpreting her or his behavior and mannerisms. Most of the time, this is sufficient to accurately assess someone’s current emotional state, but because of our own limitations to perceive the “unobservable,” we make mistakes resulting in a misinterpretation of a person’s actual feelings. According to the RL, rewards provide an incentive that leads to what is known as, “operant conditioning,” in which a person will voluntarily change her or his behavior and behavior paradigm to receive a reward . For example, a child is promised a reward if she or he does well on a math test (see Figure 2). To attain this reward, the child voluntarily changes her or his behavior by studying more or paying more attention to homework assignments. When the reward is received, these changes in behavior become part of the behavioral algorithm used by the child to determine her or his actions in a given environment. What is the so-called “META” of video gaming, and why is it important to video gaming as a culture and cognitive exercise? By “cognitive exercise” I mean the experience of gaming as a rule- and rewards-based event that requires one’s cognitive functions to perform successfully and routinely. In this context, it is possible extrapolate the consideration of META to apply to all forms and genres of gaming that rely on cognitive function for performance. 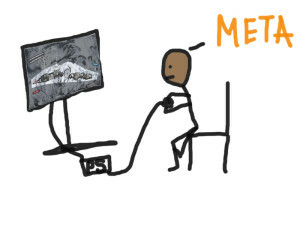 Likewise, it can be said with some confidence that the META of video gaming is derivative of the META of all gaming. But what do we mean by META? And how is it related to gaming as a “competitive” cognitive exercise? 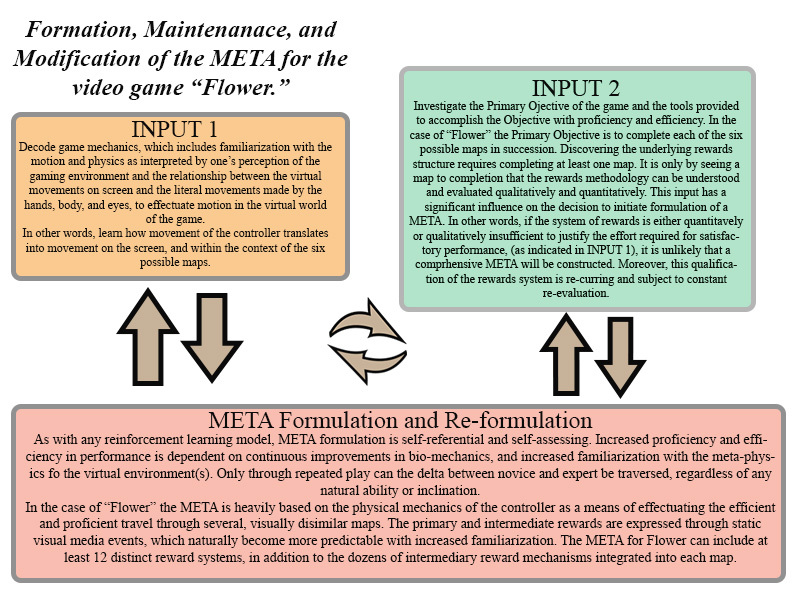 The theory of a “Meta” for video gaming is not new but perhaps, newly discovered, in that more attention is being paid to its creation and maintenance as a cognitive knowledge structure. These act as inputs to the formulation of behavior scripts that define an individual’s actions and reactions given a specific environment. As one participates in a competitive activity, such as “chess”, or volleyball, they develop a knowledge structure that reflects her or his continuously evolving strategy to achieve the game’s Primary Objective. Here, the word “strategy” includes the adaptive learning of the game’s mechanics, as well as, the player’s various functions within the gaming environment. Moreover, it is influenced and recognizable by its constantly changing, tactical expressions. 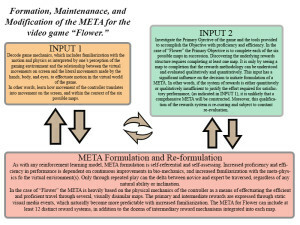 Given this definition, the META of video games such as “Flower” can be equated to the evolving strategies and tactics necessary to complete each map (see Video below). With repetition, a player becomes more proficient through trial and error, thereby informing and rewriting her or his META for the game. META efficiency, therefore, is analogous to performance proficiency. In other words, the more proficiently a player performs in the attainment of the game’s Primary Objective, the more efficient the META upon which the performance is based. In this way, performance proficiency and META efficiency are directly tied to repeated play and exposure to the game.